PADI IDC Phuket propose you these different packages. PADI IDC Phuket Thailand is very flexible, we can tailor made your own package. All these professional courses and Scuba Diving Instructor courses are taught by permanent Platinum PADI Course Director winner of many PADI Awards. All the professional courses including PADI IDC are taught at All 4 Diving Academy 5 Star IDC center facilities in Phuket Thailand. Accommodation available for 500 THB per night , located in our dive center. Please look below to see what is included in the packages. PADI IDC Phuket Thailand: the minimum requirement for a PADI IDC is 7 days. At All 4 Diving Academy we have extended our PADI IDC Phuket Thailand to 14 days, including different workshops, these workshops are conducted either in swimming pool or in open water training dives, we also have included extra presentations in confined water (at least 4 extras) and open water training dives. We organize also workshops in the classroom. We continuously evaluate you during these 14 days to make sure with we will successful in your PADI IE (Instructor Examination) and the most important in your career in diving as an PADI Instructor/Scuba diving Instructor. We have included for all our PADI IDC Thailand candidates free scuba diving before the IDC for 8 days before your PADI IDC in Thailand to the best dive sites such as Koh Phi Phi, King Cruiser, Shark point, Koh Doc Mai, Racha Noi and Yai. We want our students to have a wonderful and memorable experience with us at All 4 Diving academy in Phuket, Thailand. Free Enriched Air course and PADI Oxygen provider* to all our PADI IDC Thailand candidates. PADI requires 2 open water training dives, we will do 2 extra workshop dives. 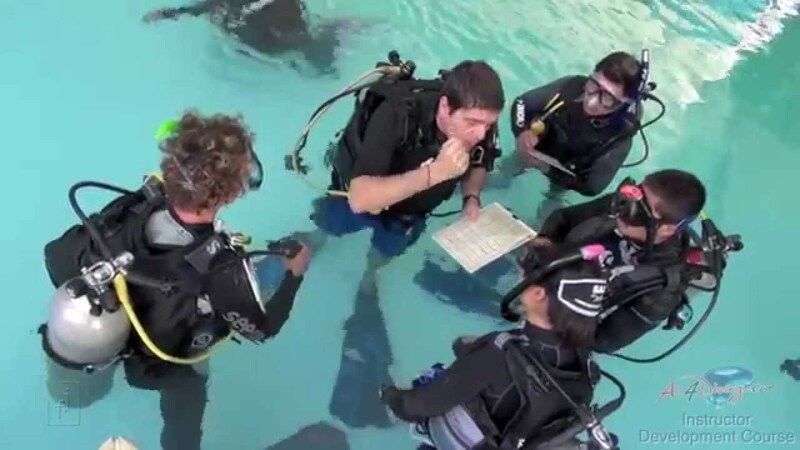 In confined water, PADI requires 4 confined water presentations with us you will do at least 8. Workshop in open water for: Ascents and Descents, CESA, Lift bag, Knots, Navigation, PPB, Rescue exercises. In classroom, workshop on planning courses in different areas of the world. Come and enjoy the most beautiful dive sites around Phuket and Koh Phi Phi before you your PADI IDC Thailand. We offer to all our PADI IDC candidates 8 days free scuba diving on our M/V Mermaid yacht (breakfast and lunch are freshly cooked on the boat…). 100 logged dives including experience in deep, night and navigation dives. Be certified in CPR training, such as Emergency First Response within the last 24 months. In the PADI IDC Phuket Thailand, there is 2 parts, the first part is the PADI Assistant Instructor and the second part is the OWSI (Open Water Scuba Instructor), these two parts together are the PADI IDC. …and general diving skills and professionalism. Ending ceremony, now you are a PADI Instructor !! !